The biggest bet is the Juanda?Greenstien match and we have a slim lead there. Pressure is on, and I ended day one below average but have great history in this event, winning it last year and in 2004. There are subtle nuances to playing limit hold'em tournaments that even some of the great limit players in the world get wrong. 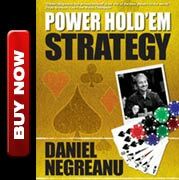 One mistake in particular deals with being more concerned with concealing the strength of their hand than actually playing the hand the best way it can be played in a typical field with weaker opponents. I'll use K-Q suited as an example. That hand plays better against four players than it does against one lone pre-flop raiser. I often see successful online players specifically, misplay these types of hands in certain situations because they "always three bet," but that often leaves them heads up with say, A-J, instead of four ways with hands like Q-10, K-8 suited, and 4d 5d. 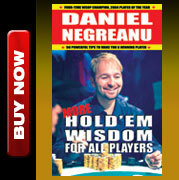 This isn't going to turn into a limit hold'em lecture, but trust me, I'm definitely right about this one. OK, time for bed... work tomorrow. If I happen to bust from the limit hold'em there is a 10k PLO event at 5:00pm. In fact, I will likely buy into that event regardless. Need to get back to work.